SOLFEX energy systems is pleased to announce it's new range of Electric Vehicle (EV) Charging solutions from world renown manufacturers, Rolec EV and Schneider Electric. The new range is an extensive collection of EV Chargers, cables and accessories. Our EV Charging solutions cover a variety of applications and are suitable for any project, from domestic “at home” charging, to large commercial installations for service stations and car parks. To coincide with the EV Charging range, we have also launched a new section of our website, from there you can browse our current EV offering, view technical data and images, and also see useful information on current EV charging technology if you need bringing up to speed. Get yourself up to speed at one of our training days. For more information on Samsung EHS Heat Pumps, click here. £100 cashback voucher1 per Therma V Heat Pump, up to the 4th purchase. £300 BONUS cashback voucher1 for the 5th Heat Pump purchased. 1. Cashback vouchers will apply to Therma V units purchased and registered for warranty between 1st August to 31st October 2016. 2. Warranty registration requires: return of LG selection software report and either (A) MCS compliance certificate or (B) LG commissioning form per installation. 3. Up to a maximum of £1,400.00 per customer, limited vouchers are available and the scheme will close upon all vouchers being claimed. 4. Cashback vouchers will be delivered within 28 days of receiveing the successful warranty registration. 5. Only from participating distributors. When installing an electric underfloor heating system, we strongly recommend embedding the heating mat/element into a self levelling compound in order to protect the heating element and to leave a perfect surface on which to apply the flooring finish. That's why we are pleased to introduce our new RapidSet Self levelling compound. RapidSet is a flexible, fibre reinforced and protein free cement based formulation designed for smoothing and levelling subfloors prior to the installation of floor coverings. RapidSet can be applied from depths of 2mm - 50mm in one application and making it ideal for all common substrates including underfloor heating systems. As the name suggests, RapidSet is fast setting allowing for ceramic, porcelain and natural stone tiles to be applied after 3 hours and impervious floor finishes such as decorative vinyl after 24 hours. RapidSet Self Levelling floor compound is in stock now and available for your next underfloor heating project. For more information, click here. SOLFEX energy systems is helping to take the hassle out of large lengths of pipe, so that you can take advantage of the savings of ordering larger coils, by giving away free pipe decoilers. To claim your free pipe decoiler, simply order 1,000m or more of our Pexline 5 Layer pipe with a full system. * Please note, pipe must be dispatched as 500m lengths, for orders of more than 1000m, the pipe will be dispatched as multiples of 500m lengths with any remainder being supplied as a single length. Offer limited to one pipe decoiler per customer. While stocks last. Offer ends 31st August 2016. 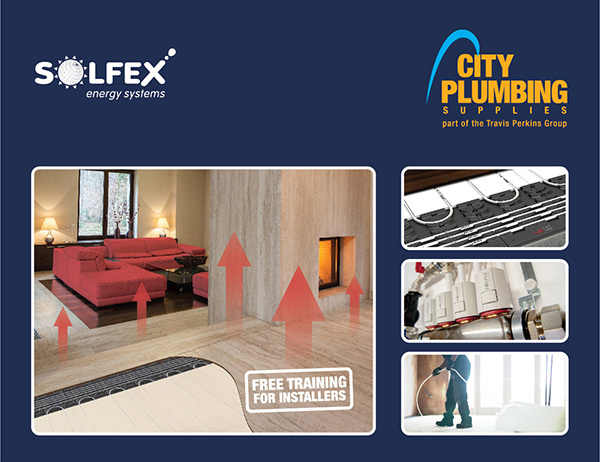 SOLFEX energy systems reserve the right to change or amend this offer.